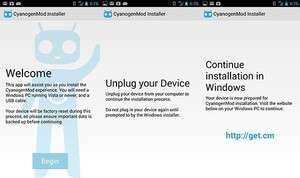 CyanogenMod Installer can be used by all those who considered it was too complicated to install CyanogenMod on their phones the old way, by downloading several patches or files from the Internet. One needs to run CyanogenMod Installer on their PC as well as the corresponding mobile app on their device, then start installing the latest version of CyanogenMod. Version 1.0.0.0 Beta is a freeware program which does not have restrictions and it's free so it doesn't cost anything. For security reasons, you should also check out the CyanogenMod Installer download at LO4D.com which includes virus and malware tests. Additional screenshots of this application download may be available, too. 3.2 out of 5 based on 32 ratings. CyanogenMod Installer has a presence on social networks.